Imagine you’re out on a lake, and you haven't caught any fish. You’ve gotten the best fishing rod, the best bait offered in the nearby town, and you’re in a prime location. For some reason, the fish have decided to go into hiding.You look into the water, only to find the water is too murky to see into. You don’t know if the fish are out towards the middle of the lake or hiding in the reefs near the shore. While you can’t see the fish, you know they’re sitting there. That’s why you should invest in the fish finders, a simple gadget that will help you find out where the fish are hiding. If you’ve never used a fish finder, you’re missing out. They can locate and track the fish for the location where you are. They scan under the waves and pinpoint where each fish is in proportion to your location. They can tell the temperature of the water, and how deep it is in certain spots. 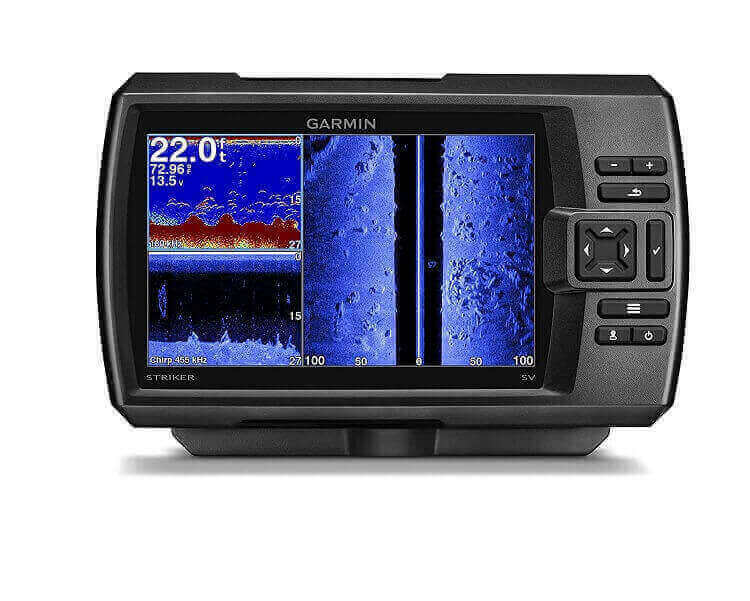 This fish finder review and guide will talk about the best fish finder for the money 2019 available on the market. When you’re reeling the biggest fish in the pond, you’ll be thrilled you had a fish finder to help you out. 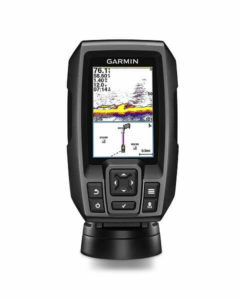 What is a Good Price for a Fish Finder? When compared to other finders, this screen is relatively small, but it still gets the job done. Since it’s in full color and has high contrast, you can still see everything quite clearly. The only downside is that you have to switch between menus, which can be a problem if you are trying to find fish and mark your location. Overall, it’s not necessarily a deal breaker, but it may be enough to warrant a larger screen. Fortunately, the Striker can come in bigger sizes if you want to upgrade. Garmin made a name for itself in car navigation systems, so it makes sense that it would also be king of maps out on the water. What’s great about this finder is that you can mark your hot spots so that returning to them is even simpler. Whether you’re out on the open water or a river, you can track your progress quite easily. As we mentioned, the strength of a fish finder is in how well it can locate the fish, which is why you need a high-quality transducer. CHIRP technology is one of the best you can find, and it provides a 200-watt RMS signal that can reach down to 1,600 feet in fresh water and 750 feet in salt water. Overall, you can find plenty of fish with this device. 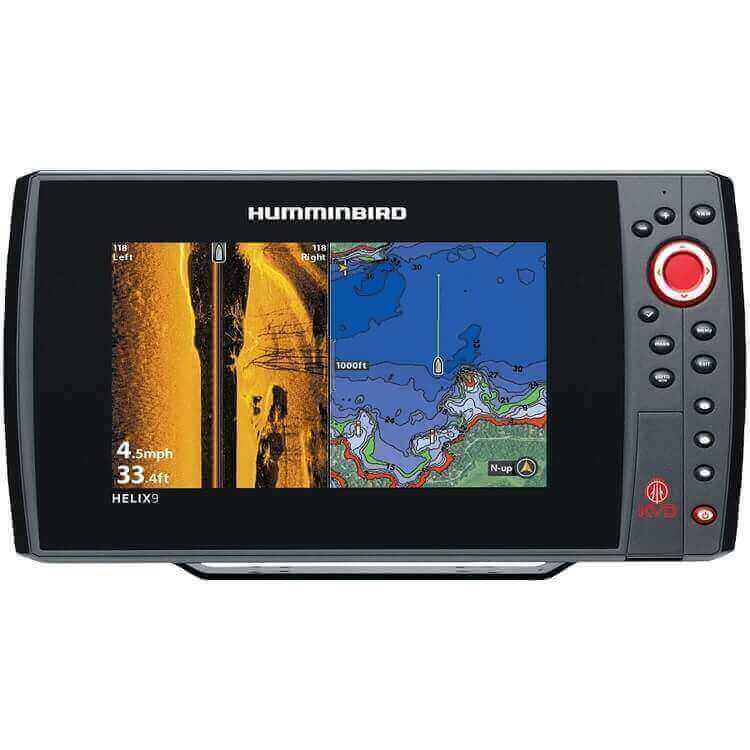 This unit has a colorful and compact 3.5 inch color screen that is fully equipped with a Garmin high-sensitivity GPS and Garmin’s very own Sonar, which uses Garmin CHIRP ClearVu Scanning. 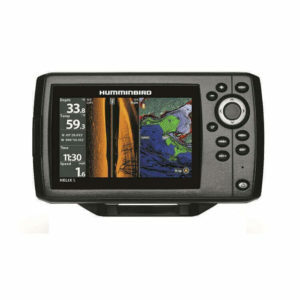 This GPS gives you the ability to mark your favorite hotspots and fishing areas, docks, and slipways, while using high-speed data technology to display any information that you may need, immediately on the screen. This model comes with a Garmin Transducer with CHIRP and CHIRP ClearVu, and for a small unit can put out an impressive 500 watts of power. It also comes with a built in flasher. It has an IPX-7 water rating, so it is incredibly water resistant. This Garmin weighs in at only 230 grams, so it is super lightweight and portable for travel and for mounting anywhere. In freshwater, this unit can register a maximum depth of 1,750 feet, and in saltwater it can hit depths up to 830 feet. Can easily save your favorite fishing spots, slipways, and docks so that you don’t have to remember where they are. When it comes to fish finders and fishing GPS technology, the HELIX 5 delivers some of the best in functionality and creating a seamless user experience for fishing pros and hobbyists. This unit uses precise broadband CHIRP, a Reflex interface, imaging sonar and the power to chart and create maps using Auto Chart Live. The HELIX 5 has taken what is already a premier fish finder tool, and taken it to new heights in terms of features and creating an even better user interface. The display looks rich and clear, and is powered with 4,000 watts of PTP power output. The screen can produce 256 colors and has a fully backlit display so that it is easy to read out in the sun and even at night. The CHIRP sonar that is built into this model is second to none in terms of performance, and always gives you a clear picture and measurement of the floor and surface beneath your boat, as well as the location of the fish around it. Another feature that we really enjoy about this Humingbird is that it comes with a built in SD card slot so that you can save your favorite waypoints to it. You can even upload additional maps to your software using the SD card feature. All around, this is a quality fish finder that provides a simple interface, reliable software and quality hardware at a pretty reasonable price. 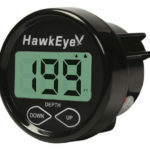 This best fish finder would be great for intermediate fisherman. 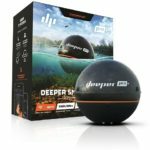 It may lack some of the advanced features that more experienced fishers may want, while this may be a little too advanced for a fishing novice. Your fishfinder needs to accomplish two objectives: find the fish and help you record where they like to hide at your favorite fishing spot. In both respects, Garmin’s Striker 7SV definitely delivers the goods and then some. This superior scanning sonar gives one of the most complete images available of what is in the water around you and how deep the fish are hiding in real time with near-photographic detail. In terms of an easy to use interface, this model uses dedicated navigation and function buttons to provide reliable responses for more intuitive operation even by novice users. Moreover, the 7SV also has a built in Garmin GPS that allows you to make your own waypoint maps, which makes marking all those stumps, docks, and brush piles as easy as clicking a button or two. All map information is transferrable to other Garmin fish finder devices if you upgrade as well, adding even more versatility to the 7SV. Additionally, the 7SV also has its own rechargeable battery pack that helps you stay on the water all day long, thereby increasing your chances of finally reeling in that trophy catch you’ve been looking for all these years. Furthermore, Garmin’s fish finder also has a built-in CHIRP continuous sweep sonar that provides the widest range of sonar profile information available, allowing you to find and mark where the fish like to hide more accurately. Best of all though, the transducer on the 7SV offers “sideview” sonar for a clearer picture of what is around you and your boat while you are out on the water. Spend more time catching fish and less time trying to find where they are hiding with the Helix 7 CHIRP GPS G2 Fish finder. Using side-by-side dual imaging technology, this fish finder not only lets you map structures and schools, but also allows you to view both CHIRP Down Imaging and Switchfire Sonar data at the same time, providing the most complete image of the underwater environment possible. In addition to the large 16-bit display, the Helix 7 also features an integrated GPS that store up to 2500 waypoints and 50 routes so you can mark the coordinates of all the best fishing spots on your favorite lakes and rivers. Furthermore, all you need to do to integrate high quality maps and navigational data for any lake in your region is load up a microSD card with Humminbird’s Lake Master, Auto Chart, Auto Chart Pro and Navionics software suites and pop it right into the integrated SD card slot. Hummingbird’s unique software packages take the guesswork out of knowing where to fish and how deep the fish are currently swimming so you can better decide how to go about landing that trophy catch of a lifetime. Best of all though, the Helix 7 is a complete package, and includes underwater sonar transducer and all necessary mounting hardware for quick and easy installation on your boat. All you need to do is power up the device, toss the transducer in the water, and wait for sonar returns to start rolling in. 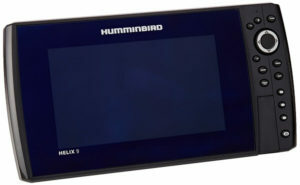 Make every fishing expedition a trophy winner with the Humminbird Helix 7 CHIRP DI GPS G2 Fishfinder. Large 7” 16-bit dual display allows you to watch both CHIRP and standard sonar return data side by side. This fish finder uses Wi-Fi to help you connect with your smartphone or tablet. When you’re out in the middle of the woods, you need communication to help you. Since you’re operating off Wi-Fi, you can use the fish finder wherever you plan on going. 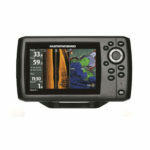 The fish finder has a GPS mode to help you navigate your way around your fishing area. When you can target where you want to go, you can find some of the best places to fish. The fish finder is compatible to use in fresh and salt water, allowing you to try out different fishing methods. If you want to change it up, you can use the fish finder to help you find any fish. The fish finder uses a dual frequency that allows you to fish in deep or shallow water. Whether you’re on a boat or on the shore, you can track the movement of the fish to assist you. 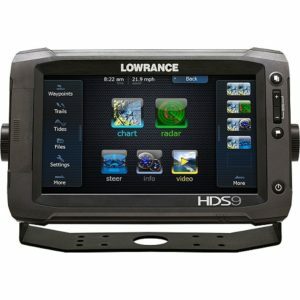 For those who want the ultimate in fish finding technology, we have the Lowrance HDS-9 as a top rated fish finder. Not only do you get a large screen, but it’s touch activated for even more convenience. It’s so wide that you can chart two maps at once, and it’s all high-definition which allows you to create 3D models of the bottom of any lake or river in real time. Overall, this is as good as it gets. The charting technology on this finder is incredible, which is why it has such a high price tag. You can find your location on the map and then scan the whole area and produce a high-quality, high-definition 3D reading. Finding fish has never been easier. The reason that you can develop such comprehensive scans of the bottom is that the transducer uses four separate channels. This means that you get much more than most other finders, making this the ultimate fishing accessory. 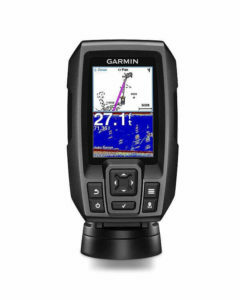 Unlike the Garmin above, this fish finder is built for those who want to see everything at once. With nine-inches of screen real estate, this is almost more like a tablet than a regular finder, making it a valuable addition to any boat. Best of all, the control panel is intuitive and enables you to work faster. While many fish finders point directly underneath your boat, higher end units like this one will sweep to the sides as well. Considering that you are casting out from the ship rather than dangling lines beneath it, side sweeping is much more valuable as it allows you to find fish wherever you are, rather than finding them, moving the boat, and then trying to catch them. These days, if your finder doesn’t have GPS Combo, then you need to upgrade. Not only does it make it easier to pinpoint your location when you’re out on the open water, but it will help you mark hot zones so that you can return for a big haul next time. The fish finder features a 4.3-inch display to help you locate the fish. It has a LED backlight that makes it easy to read in the bright sunlight. It is optically bonded for sharp colors that pop. The wide viewing angles allow you to see more around you. The dual-channel sonar provides a wide spectrum of everything around the area. It uses a CHIRP DownVision sonar that produces photo-like images for clear pictures. The second CHIRP sonar focuses in on fish, providing you the information you need. 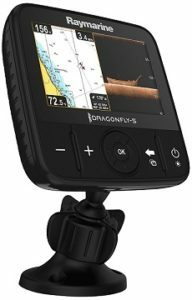 The Dragonfly Pro CHIRP allows you to stream your sonar data to your phone live and in the moment. You can download the Raymarine Wi-Fish mobile app to track all the information. It allows you to rewind, save, and share your catch with your friends and family. You can upload your favorite pics right away. The mounting ball is removable, allowing you to take it on another boat if you’d like. It is compatible with aftermarket ball and socket mounting systems, allowing you to customize your mounting options. The Dragonfly Pro CHIRP does include storage for 3000 waypoints and 15 tracks. 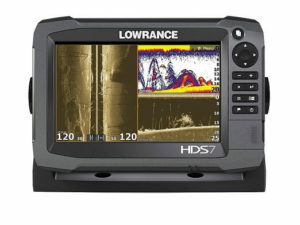 Finally, we come to the HDS-7 from Lowrance. I have had limited experience with this company, but from what I know it is a fantastic maker of fish finders, and the HDS-7 is no exception. This particular model has a seven-inch touchscreen, which makes it one of the most high-tech options you can find anywhere. If you like a more ergonomic design and want something that is more user-friendly, the HDS-7 could be for you. GPS, which means that you get some of the best navionics possible, as well as a huge supply of pre-loaded maps to help you get started. These maps are only for North America, however, so if you go traveling outside of that region, you will have to create your charts. The other thing that I like about this particular model is the mounting bracket. You can swivel the device on a horizontal axis, making it easier than ever to adjust the screen to your liking. Also, the housing is weather resistant, which is a nice touch. There are many factors to consider before buying a fish finder. Following these steps will provide you the information you need to find the best fish finder for the money. When you’re looking for a fish locator, the frequency range is important to understand which is the best one for you. There are three types of frequencies, including dual, single, and multiple frequencies. They come in 50, 83, 192, or 200 kHz. Higher frequencies, such as 192 or 200, are ideal for fishing in shallow water. Lower frequencies, such as 50 or 83, are perfect for deep water fishing. To find the top fish finder for the money, knowing what area you’re planning on using it in will lead to more catches. Remember that the higher the frequency, the more detail you’ll have on the screen. Wattage is the how the finder is powered. The more wattage you have on the fish finder, the faster the response time will be. If you have more wattage, you can see deeper into the water and find the fish. Fishing in shallow water requires less wattage for better it is to see the surrounding area. When you combine the frequency range and the wattage, you can get a clear picture of what it looks like under the surface. A good way to measure this is to remember that at 50 kHz with every 100 watts of power, you can read up to 400 feet deep. When you’re using 240 kHz at 100 watts of power, you’ll have readings up to 100 feet. Just like with TV’s and computer screens, you want a high resolution to see everything. You want a fish locator that has a screen resolution of at least 240 x 160 pixels for sight. If you find that this is too blocky, and cannot tell the differences on the screen, you can opt for a higher resolution screen. When you combine the resolution with the size of the screen, you’ll see more in a clearer picture. You should budget for the best screen you can get for your main fish finder. For a backup, you can settle for a smaller screen, since you won’t use it all the time. While the old black and white screens are becoming obsolete, they can still be practical and useful. Depending on your budget, you may need to settle for a black and white finder. They are good for those who have never had a finder before, or want one as a backup. Colored screens are the new standard, and they are much more reliable than their black and white counterparts. They’re easier to read in the sun and make it easy to see what’s going on around you. If you can manage it, a glowing screen will be more helpful than the black and white screen. The transducer is what makes the finder capable of finding fish. They emit and receive the sonar waves that let you know if there are fish and other objects nearby. When it receives the data, it sends it to the main unit and switches it to the screen. Without a transducer, your finder becomes a fancy screen that doesn’t display any data. While every fish locator does come with a tran﻿sducer, you may want to invest in an after-market transducer. They can receive data faster, read more of the area, and work better than what comes with the box. You can start fishing right away with one, but you want to make sure you have a transducer that works for you. You want to consider the transducer material, cone angles, and beams for your fish finder. Also have a look fish finder review in online before purchase. Fish finders are an excellent tool that can enhance the fishing experience, and allow you to catch more fish. There are typically only two parts to a fish finder, making it easy for everyone to use. They have a screen or display that fits onto your boat and gives you the information you need to catch more fish. They will display how far down the fish are, and how deep the water is. A fish locator uses a transducer, which takes recordings of the area near the boat using sonar. The sonar bounces off fish, rocks, coral, and other objects under the water. When the sonar comes back to the transducer, this information is relayed to the display screen. It’s a basic computer showing raw data of what lies underneath the surface of the water. It is easy to read and understand display that will help you find where the fish are swimming. They’re ideal for anyone who wants to get a better idea of the surrounding area under the water. Even if you use it for kayaking, it’s good to know whether you’re near any rocks or logs. You can avoid accidents and map out the water for other adventures if you’d like. If you’ve used a fish finder before, then you might be wondering why it’s necessary to get one with a GPS. To be perfectly honest, if you are someone who likes to fish in your local area and either casts from the shore or the back of a small boat, then GPS capability may not be something that’s worthwhile. However, for any fisherman who likes to go searching for the best catch, having GPS installed on your finder can make a world of difference. Here are some of the best reasons to get the best GPS combo fish locator. ● Charting and Navionics: if you like to plot a course and navigate your way to prime fishing grounds, then you will need a GPS to do so properly. While most of these units come with pre-loaded maps, I find that you will want to get one that allows you to customize your charts so that you can return to the right spot every time. ● Location Saving: if you do find a perfect fishing hole, then you will want to mark it on the map, so you know where to come to next time. In this case, GPS allows you to do so with pinpoint accuracy. 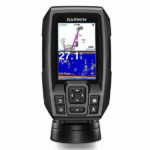 ● Depth Finder: because GPS models have maps and charting capabilities, that means that you get a lay of the land in a way that isn’t possible with a standard finder. This way, you can see the bottom even easier, making your depth readings much easier to decipher. ● Water Temperature: depending on where you fish, you may encounter spots where cold and warm water meet. Also, you can track your next catch based on if it’s a cold or warm water species, meaning this is a handy feature to have. Even if you’ve used a fish finder before, having a Chartplotter/﻿﻿GPS installed means that there is a whole new level of your fishing experience. To make the most out of your added features, here are some things that you should always remember. ● Contour Lines: use these things to your advantage, as they will show you the topography of the bottom of your body of water. Many fish like to hang out in similar depths, so knowing where there are hills and valleys beneath your ship can make a huge difference in your haul. ● Buoys: when you go out into the ocean, you will see buoys to mark different depths and shipping lanes. Having a GPS means that you can see where these are without having to plot them yourself. ● Wrecks: not only do fish like to hang around shipwrecks, but you can do a little bit of exploring while you’re out on the water. Some GPS units will highlight wrecks on the map for you so you can be better prepared for them. ● Seabed: as I mentioned, some species like to hang out at certain depths. GPS tracking means that you can get a layout of the seabed when you’re out on the ocean, meaning that you can position yourself just right to get the best catch. There are a lot of factors that go into finding a right fish finder for the money. Depending on the type of fishing you’re doing will factor into the price tag. There are some that are under $﻿2﻿00, while others can run up to over $1000. You should consider where you’re fishing, what type of fish you want to catch, and what features you’ll need.If you’re on a budget, you don’t want to spend too much money on a fish finder. Some of the finders are ones that do everything you want them to do, and won’t break the bank. If you’re looking for the ideal price for a fish finder, you may want to consider spending at least﻿﻿ ﻿﻿$300, or under $500, but no more than $1000. Unless you can afford some of the more expensive top rated fish finders, your range should be between $300-1000. 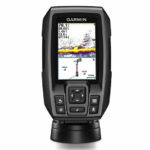 Overall, if you want to get the best fish finder, then our top pick has to be either the Humminbird Helix 7 or the Garmin Striker 7SV. We love the large screens and comprehensive functions that you get with both devices, as well as the rugged dependability. If you want to save money, though, the Garmin Striker 4cv will be your next best bet as it comes with high-performance results, even with a smaller screen. Fishing is a modern fashion. I mean that anyone from your site will be able how to catch fish? Do I want to know the people how to catch a fish? Fishing has become a important part to pass our leisure. I love fishing, when I got time then fishing makes me crazy to enjoy a wonderful time. Wish to read it before to buy a fish finder. I think paying a bit for a fish finder is okay because you are getting a lot of help from this device. 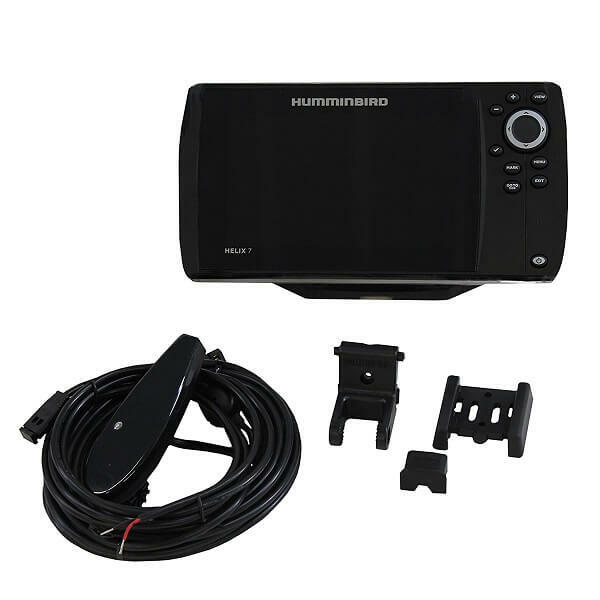 I will put Humminbird 409920-1 & Raymarine Dragonfly 5 in front of the cheaper items as the performance of these fish finders are greater than Garmin Striker 4. Thanks for the information. Happy to read this kind of article because my hobby is fishing. This was a very educative piece, i have a team of fish lovers and we now know where to be getting information about fishing and other activities. Great review james! You explained very clearly especially for the Garmin Striker 4. I Personally love the Garmin Striker 4 and really recommended it. Thanks Glenn, yes the Garmin Striker 4 is a winner for sure but these fish finders these days are all great.